Now that the "blue wave" turned out to be little more than a tsunami in a bath tub, and the Democrats have spent more money per gained Congressional seat than anyone since the Big Bang, perhaps we can get back to the issues that matter. Given that there will be a few new faces in our legislature here in Wyoming, and a new resident in the gubernatorial mansion, this might be a good time to remind everyone out there of the foremost issue facing our state: big government. Predictions of big gains in revenue are little more than rosy forecasts that some people treat like hard cash in the bank. The other side of government finances - expenditures - obviously also deserve attention, and perhaps even more so now that we are not going into a budget session. Our lawmakers tend to get focused on non-fiscal issues, treating the supplementary budget more as an ancillary document than a major bill. That would be unfortunate: usually, the supplementary budget runs deep into the hundreds of pages, and its significance for state spending is big enough that the idea of a biennium budget really is nothing more than a formality. As a crash course in Wyoming state spending, here is a review and an interstate comparison, courtesy of the National Association of State Budget Officers. Over the past five years, 2012-2017, total Wyoming state spending has actually declined by 12.7 percent. However, this is not a real decline in ongoing spending - it is almost entirely attributable to a 34.9-percent decline in federal funds. This decline, in turn, is due to the phase-out of the American Recovery and Reinvestment Act. 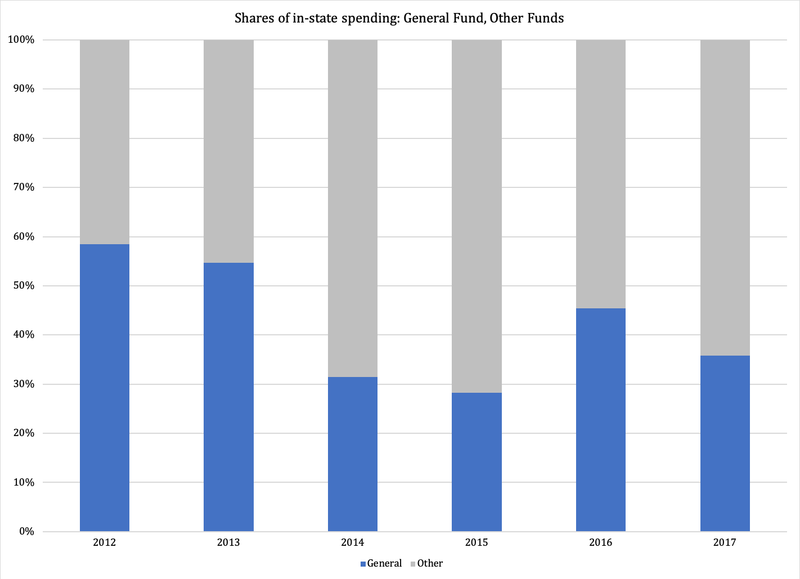 To get a more accurate picture of where state spending is, we isolate General and Other Funds. There was actually a decline in spending there, too, but only by a total of four percent over the five-year period. Still notable and something to be happy about - it could have been much worse - but far from as impressive as in Pennsylvania (-14 percent) or West Virginia (-35.1 percent). Furthermore, part of the decline in in-state spending is due to a decline in maintenance-of-effort (MoE) spending: to keep federal funds coming, states have to add money onto what Congress sends our way. Medicaid is a good example, where our state pays almost half the bill. It is also important to keep in mind that a four-percent decline in in-state spending is not as impressive if we place it next to our state economy. From 2012 to 2017, inflation-adjusted GDP grew by a total of 0.96 percent. Yes, a total of 0.96 percent. Over five years. In view of that, and with subtraction of the decline in state spending that is due to a drop in MoE spending, a generous conclusion is that our state government has maintained its size relative our economy. A more realistic estimate would say that it has grown, in other words that the MoE decline disguises an ongoing growth in state spending. However, to get the details on that we have to wait for the Census Bureau's 2017 numbers, which unfortunately will not be available until next year. It has left more of spending to be determined in the internal appropriations process of the executive branch. In short: when we talk about General Fund spending, the conversation is about only a small portion of all the money that our state government doles out every year. The next part of this series on the state budget and state government spending will be rolled out next week, probably on Wednesday. Stay tuned!